Many boats have a dinette which frequently doubles as a second bed. By placing the table and seating on the plinth it’s also possible to use the area underneath for storage, water, sewage tank, etc. Whilst back in Australia, and at the beginning of this project, we decided not to have a dinette on Waiouru. Mainly because we don’t want to give up the space in the saloon. 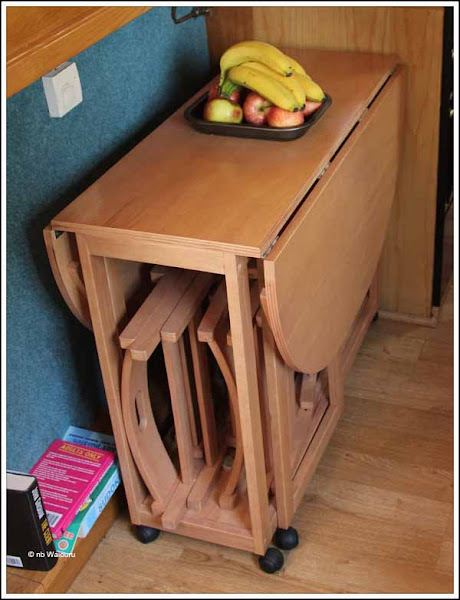 We think that we’ll be able to manage eating with a lap tray in our boat recliner chairs. However we did realise a table would provide additional bench space and would probably be necessary when we had guests so we started looking for a suitable folding table. When we moved to Kelly-Louise we both immediately realised Peter & Margaret had solved the problem for us with their folding table. The table has two folding leafs and four folding chairs that fit inside the frame. After some searching we have identified this style of table can be purchased as a kitset from stores such as Argos and cost approximately £170. When not required, our table will probably be placed under the starboard side hatch.